Malbec California, District 11, DeLue/Tully ranch. A thin skinned grape grown now mostly in Argentina though it was traditionally utilized in Bordeaux blends, but not so much anymore as it is difficult to grow in many regions. However, in the United States it is primarily used in meritage blends that compete with the traditional Bordeaux style. Being inky in color and having exceptional tannin structure, Malbec is noted for its dark fruit, slight earthiness and well balanced acidity. Pinot Noir California.,.. Lodi..Doc Harris Ranch, Lockford, District 11, Foothill area. The tremendously broad range of bouquets, flavors, textures and impressions that pinot noir can produce sometimes confuses tasters. In the broadest terms, the wine tends to be of light to medium body with an aroma reminiscent of black cherry, raspberry or currant. The grape's color when young, often compared to that of garnet, is often much lighter than that of other red wines. This is because pinot noir has relatively small amounts of red pigment due to its thin skin. Zinfandel "Old Vine" Diekman Estate, District 11, Lodi, Morales Farm Management.Considered now to be indigenous to California, this variety produces deep colored, high alcohol and spicy toned wines. Famous for its jammy and plum fruit aromas this Zin, as it is affectionately called, will give great length on the palate and will age very well. Chardonnay Woodbridge, California.. District 11, Kramer Ranch, Delta area. This is a winemaker’s dream wine because of its natural affinity to oak. There are so many combinations of different types of oak with so many different toasting styles to be had. This makes for an incredible number of different Chardonnays to choose from and this allows winemakers to become very creative.Our Chardonnay, when "naked", (without oak), shows ripe pear fruit on the nose and it is extraordinarily well balanced. We recommend D-47 yeast, oaking at 50 grams American medium yeast for the primary and 50 grams French medium in the secondary. Enjoy! TA 5.8, pH 3.37, Free SO2 30, S.G. 1.095 at 15C. Muscat Lockford, California.. District 11 Moralex Farm. Its ancient roots from the Mediterranean basin are brought to life upon discovering the first aromas of this gorgeous floral variety. Powerful and blessed with intoxicating floral tones, the Muscat is very much misunderstood. Its beauty is in its powerful terpene rich compounds that create the intense rose and violet floral tones. A winemaker must create a Muscat once in their careers. We recommend 1122 yeast. Very interesting wine. Pinot Grigio Harris Ranch, Lockford Area, Foothills, District 11. This variety has surpassed Sauvignon Blanc to become the number two grape variety in North America. This is due mainly to its lighter structure and more fruit and floral tones that Chardonnays lose when over wooded. Typically Pinot Grigio comes in at 12.5% alcohol which is dramatically different from most Chardonnays that are usually 13.5 +. The net result is a very refreshing clean wine that is crisper on the palate. TA 5.4, pH 3.52, Free SO2 30, S.G. 1.095 at 15C. Riesling Lodi, California.. District 11, Alexander Farms Old Vines. Here's another terpene rich varietal that has long been considered the King in its native Germany. Riesling creates some of the most elegant and delicate white wines in the world. They are zesty and fresh due to their inherent higher acidity and terpene content. You will marvel at the fresh aromas of apricot and peach when the wine is young and watch it evolve into more nutty tones. We recommend 1122 yeast. Sauvignon Blanc Lodi, California..District 11.. Ehlers Ranch. 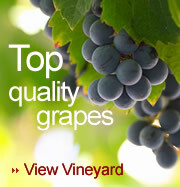 As we have all seen in the last few years, New Zealand has put this variety back on the map. Their climate produces this crisp fresh herbaceous style of wine.Our style is quite different in that our raw material comes from the warmer climes on California and so the herbaceous character is not as intense but our structure is rounder and more luscious. Well balanced and full bodied, our Sauvignon Blanc will age longer in the bottle. We recommend D-47 yeast, oaking at 50 grams American medium for the primary and 50 grams French medium in the secondary. Semillon Harris Ranch, Lockford Area, Foothills, District 11 Semillon ripens earlier in the season than most grapes and is less likely to be damaged by rains or frost. It produces wines that are full flavored rich and aromatic. Semillon is most often blended with other varieties (especially Sauvignon Blanc) to take advantage of the strengths of each variety. Semillon is one of the three approved varieties (Semillon, Sauvignon Blanc and Muscadelle) for making white wines in the Bordeaux region of France. Together with Sauvignon Blanc, it is the base for the great sweet wines of Sauternes and Barsac where it is affected by Botrytis cinerea. Whether in the sweet wines or in dryer styles, Semillon has the ability to age for a very long time. Viognier California, Lodi. District 12, Merced Region, Bar Ranch. The Viognier grape was once a little used variety best known in Condrieu, in the northern Rhone Valley of southwestern France. It is experiencing a resurgence in popularity as more of it is being planted in California and elsewhere in the world. It makes fruity wines of medium body. Stone fruit aromas (peach and apricot) are often found in wines made from Viognier along with a bit of spice. Depending on the producer, the wine can range from exquisite to ordinary. Also, depending on the producer's style, the wine matches well with 'Asian Infusion' dishes as well as many foods that are often served with Chardonnay. Recommended yeast 71B-1122. Not recommending any oak treatment.